The ShapeShift Car Holster is the answer to the issue of concealment and storage while in the car. This car holster design allows you to safely and securely dock your pistol in your car, without needing to mar the interior. Unlike previous car gun holster dock designs, you don't have to secure the ShapeShift Car Holster to the interior via screws. This way, you don't have to touch the interior, which has been a criticism of other holster dock designs. This gun holster for car use uses two durable nylon web straps, which thread through the seatback. You thread the straps through the seatback, under the seat and then insert the clips into the buckles. Then, cinch up until the slack has been taken up. That's how easy installation is for this car pistol holster mount. Once you have your car seat holster installed, you won't have to worry about it loosening. 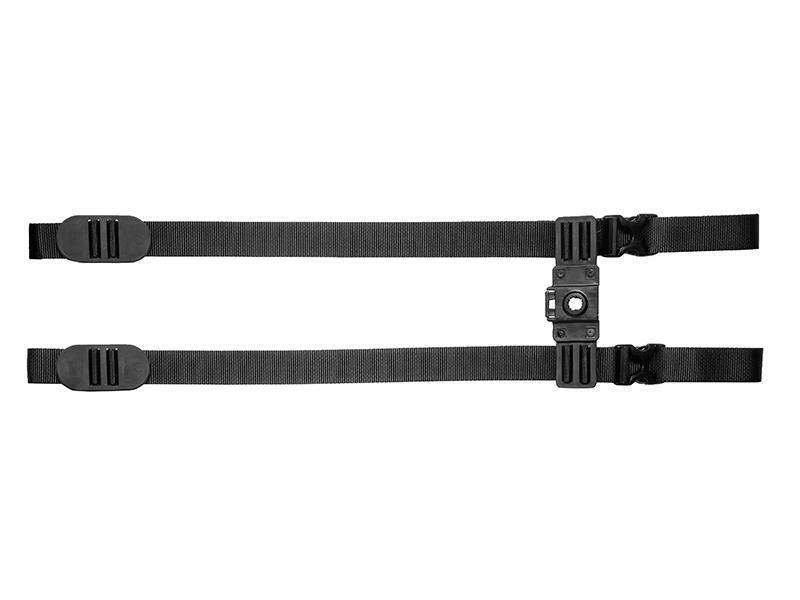 The straps include a sliding strap lock, which ensure that once the strap is set to the length that you prefer, the strap cannot slip, slide or otherwise change length. 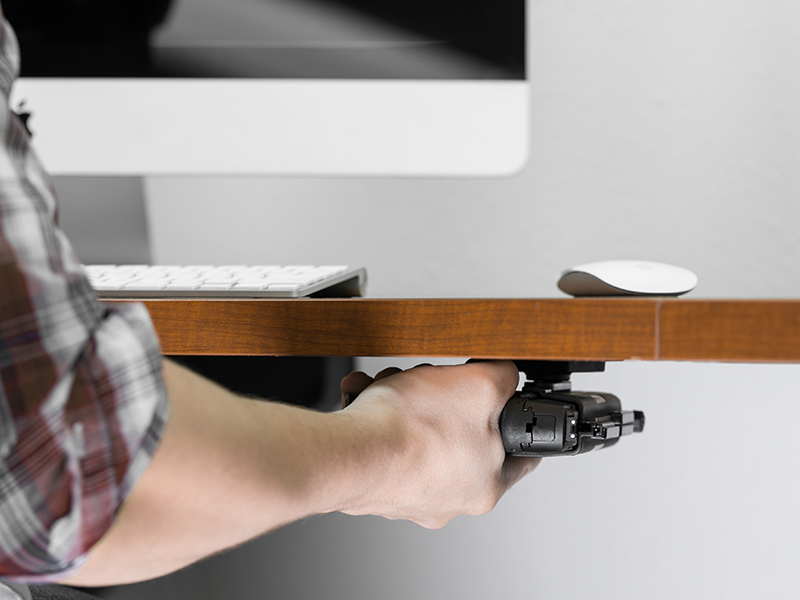 This guarantees a good tight hold, making the dock easily able to support your pistol. 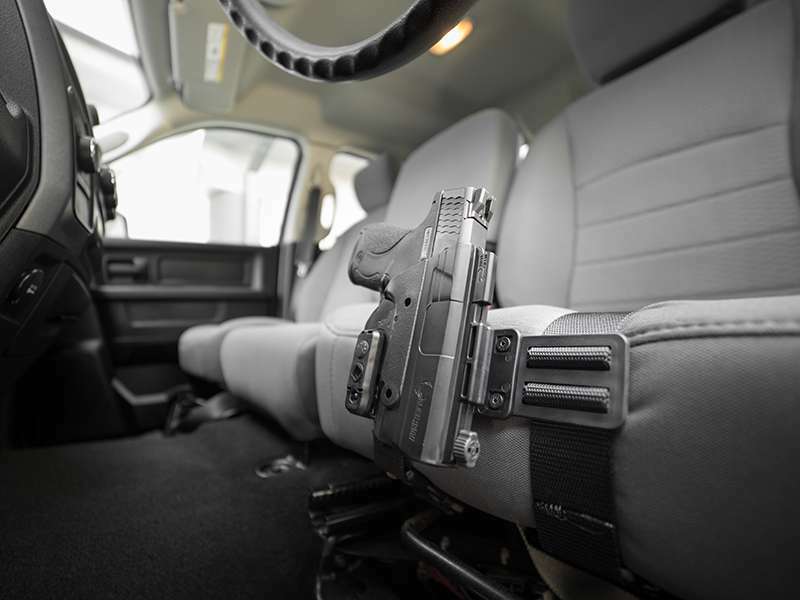 Since this car holster mount works with the ShapeShift OWB holster configuration, the holster is easily docked and cant angle adjusted to the position you desire. A vertical, horizontal or positive or negative cant are all possible. The docking spline is easily inserted and locked in place. Since the Alien Gear car seat gun holster is compatible with our ShapeShift OWB holster, you can take your gun straight off the holster mount and attach it to a paddle or belt slide attachment for carry on the waistband, or onto our Drop Leg Holster rig, or our MOLLE or backpack holster attachments for even greater versatility. No other holster system besides the ShapeShift Modular Holster System can allow you to do that. We also give you the Alien Gear Holsters Iron-Clad Guarantee. This includes a 30 Day Test Drive trial period, during which you can return the car holster for a refund if unsatisfied. We also warranty the holster for life, against any defects or damages. If you're ready for a better concealed carry car holster, start your Test Drive today! Alien Gear's home and car gun holster mount systems allow you to safely store or dock your holster and gun in any location you choose. They are designed for the ultimate in convenience when you want to store your gun without having to wear an empty holster, or when you want to safely dock your pistol in a secure location while still being able to access it. Our home and car gun holster mounting systems are compatible with both our IWB and OWB holster designs, so there's no need to choose only one holster to carry with. 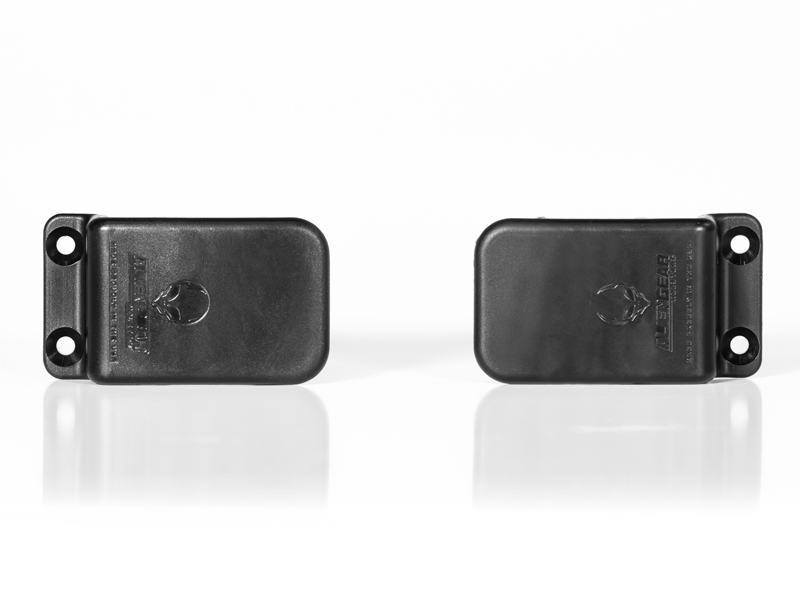 Our holster docks allow you to implement an entire carry system for the utmost in safety and convenience without the need for multiple holsters in multiple locations. The IWB holster is the default concealed carry system, but they have been limited when it comes to a vehicle gun holster...until now. Alien Gear's IWB home and vehicle gun holster dock allows you to mount your concealed carry holster where you wish. You can employ your IWB holster as a car holster, or mount to a wall or office desk when not being used. This allows you to store your gun where it can be easily accessed without needing to keep wearing an empty holster. Many carriers find that aspect of concealed carry inconvenient, but it is no longer necessary for it to be. Install our IWB holster mount in the location of your choice, or get multiple sets for easy docking in the home, office and as a vehicle holster mount as well. There are many concealed carry holsters for cars, but few that you can carry with outside the vehicle as well. 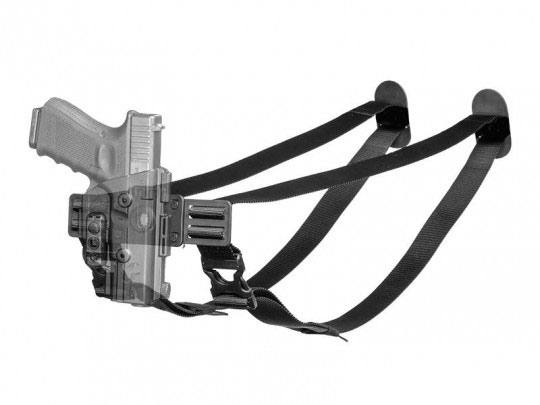 Our IWB holster mounts allow you to simply put the holster and gun back in your waistband when carrying on foot. We also have a holster mount for our Cloak Mod outside-the-waistband holster, the Cloak Dock holster mounting system. This holster mount allows you to dock your Cloak Mod in any location that you install your Cloak Dock, which can be attached to any hard surface - including a wall mount, desk mount or car mount for using your Cloak Mod as a car pistol holster. Some people employ their Cloak Docks and Cloak Mods as car holsters that can be carried if the need arises. Some use their Cloak Mod Paddle Holster as a total carry system including a vehicle holster mount while driving, a wall mount in the home and desk mount while in the office. The Cloak Dock, though, is only compatible with the Cloak Mod paddle attachment, so you will have to have the paddle attachment installed on the holster in order to utilize the Cloak Dock. 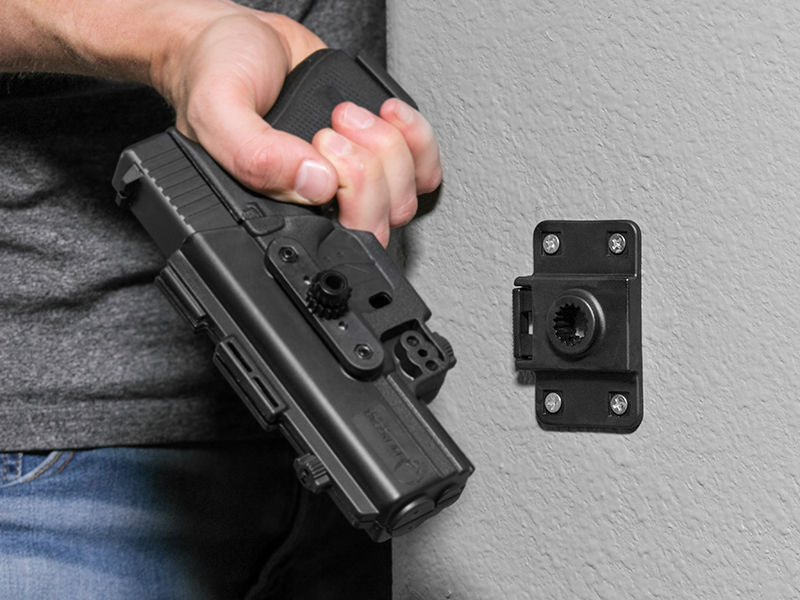 Our home, office and car gun holster mount systems are easily installed and come with all the required hardware to mount to nearly any surface imaginable. You will find wood screws, drywall screws, metal screws and hardware for mounting to hard plastic for mounting gun holster for car applications on hard plastic interior areas. The only tool you'll need is a power drill. For the Cloak Dock OWB, the included mounting bracket bar is designed to also work as a template for tapping holes in the mounting surface of your choice. For the IWB dock, your holster base can be used as a template. Tap the appropriate holes and install the docking hardware with the appropriate mounting hardware. 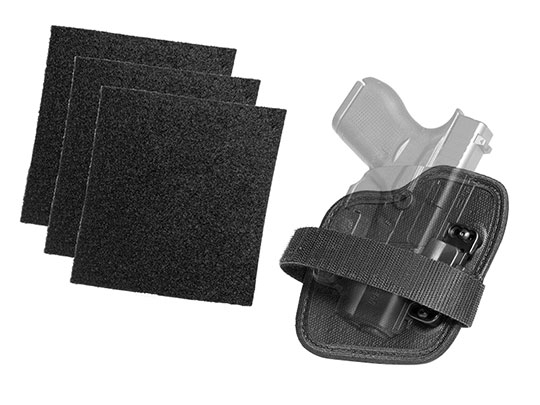 Both of our holster mounts are designed for easy use. 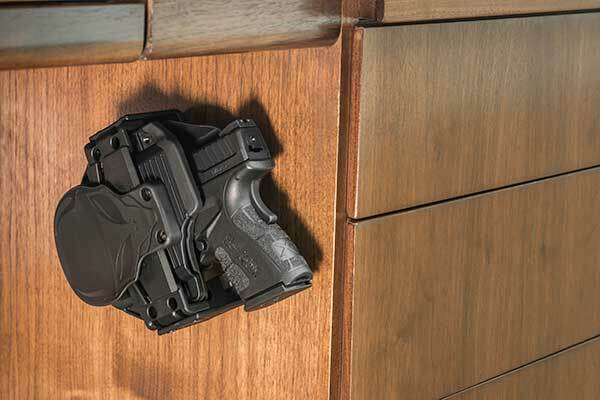 In both cases, slide your holster into the docking station until it clicks into place, securely locking your holster and pistol into your concealed carry car holster mount, wall mount or desk mount. Remove by unlatching the clips, and draw the holster out carefully. The Cloak Dock allows the Cloak Mod holster to be docked facing outward or inward, and at any cant angle. Our IWB holster dock can work with the holster facing inward or outward, but we strongly recommend you only mount your Alien Gear IWB holster facing outward. This keeps the holster and pistol from flexing outward too greatly as there is far less support for the pistol as the unsupported weight will cause the holster to droop. If you need to, drawing will be more difficult. 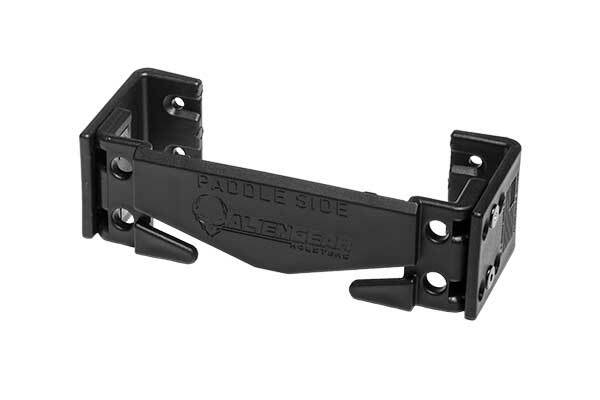 Additionally, our IWB holster dock CAN continue to work if you adjust your holster's cant angle, though it may become more difficult to successfully dock the holster. You may need to re-install the holster mounting clips for a better fit, though you may - in some instances - be able to continue using it without doing so. 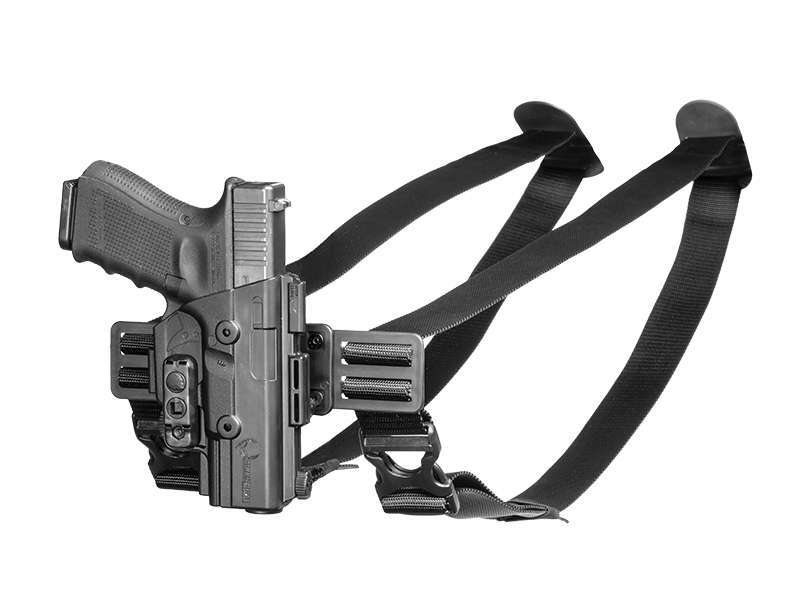 In either case, you have a mounting system that allows you to use one holster as free-standing home, office and car holsters as well as a carry holster. Each of our home, office and car holster docking systems comes with a 30-day Test Drive trial period and our Forever Warranty. Take up to 30 days to use your home or car gun holster mount and if it isn't to your satisfaction, return for a refund. We also extend a lifetime warranty for our holster mount systems. So long as you own it, we will fix any damage or defect, or replace it. Forever. Are you ready for a whole new way to carry?